Festive Season - We will be serving both our Festive Buffet Menu and Festive Three Course Menu throughout November and December. Links to the menus available at bottom of this page. Christmas Eve Breakfast being served from 0830-1130 on Christmas Eve. Please call +44 (0) 1736731224 to book. Menu available at bottom of this page. Christmas Day Lunch being served from 3pm to 5pm. Please call +44 (0) 1736 731224 to book. Menu available at the bottom of this page. The Kings Arms Paul has been awarded a Gold CHEFS (Cornwall Healthier Eating & Food Safety) Award. This is presented to businesses that achieve a high standard of food hygiene, offer healthy eating options and source some Cornish ingredients. Children welcome and dogs are welcome in the public bar. 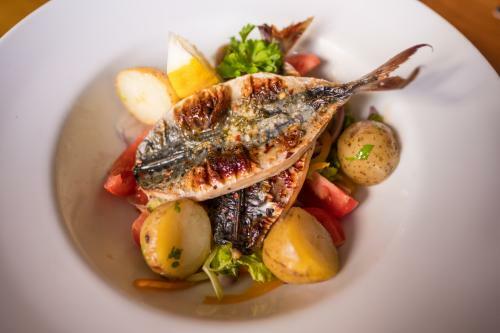 Our head chef has designed a menu that uses high quality local ingredients wherever possible and offers a wide choice of meat, our fish is locally sourced daily and vegetarian dishes. In addition to our standard menu, we have an ever-changing specials board that is regularly updated to take advantage of seasonal produce and offers. Typically, there will be a meat dish, a fish option and something exclusively vegetarian to choose from. Our specials board is updated daily. Newlyn crab is often available throughout the year served in a salad or sandwich. Out of season we recommend pre-ordering your crab to avoid disappointment. Our delicious home-cooked puddings are served with a choice of clotted cream, ice cream or custard. Chocolate Fudge Cake, Creme Caramel and Chocolate Nut Sundae are permanent features on our dessert menu and our regularly changing specials can include such delights as Rhubarb and Cinnamon Crumble, Chocolate and Baileys Cheesecake, Bakewell Tart and Lemon Meringue Pie. A childrens menu is available and we do have some high chairs for our younger customers. Our Sunday roast lunches are very popular locally and are served with vegetables, roast potatoes and all the trimmings. Smaller portions are available for children and those with reduced appetites.